Minnesota is a national leader in ethanol production, and as a result, Minnesota has more E85 and E15 fueling stations than any other state. Ethanol is big business here in Minnesota, but what exactly is ethanol and how it is it made? Today, the last day of National Chemistry Week, presents a great opportunity to learn about the process of making ethanol. The goal of National Chemistry Week is to promote the value of chemistry in everyday life – and what a role ethanol plays in our everyday lives! Even if you aren’t aware of it, most of us use this product quite regularly. Those who drive a gasoline vehicle could be using E10 (a 10% blend of ethanol) or maybe even 88 Octane (a 15% blend of ethanol) daily. For a product so intertwined in our everyday lives and transportation, it’s only fitting we simplify the process of ethanol production this week. Through the science of chemistry and biology we are able to extract ethanol from the starch of corn. The first step after the corn is harvested from the fields, is to either process it through wet milling or dry milling. The big difference between these two is that dry milling immediately begins to separate the components of the kernel not needed for ethanol, while wet milling allows the corn to steep like a teabag in hot water. Steeping is the process of allowing corn to sit in 120 Fahrenheit water for 30-40 hours before processing begins. 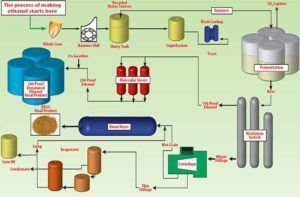 Minnesota ethanol plants mainly use the dry milling method for ethanol production. In dry milling, corn is ground into meal. Water is added to the meal, turning it into “mash” followed by the addition of enzymes, which converts the starch to simple sugars. Ammonia is added to control pH and as a fuel source for yeast. This preps the mash for fermentation, which is the second stage of ethanol production. Ethanol fermentation occurs when one glucose molecule converts to two ethanol molecules and two carbon dioxide molecules in an anaerobic (no oxygen) environment. Once the fermentation process is complete, the mash (known as “beer”) is shipped to distillation tanks where the water is removed and the ethanol is concentrated into fuel. Interesting fact: before the ethanol is blended into gasoline, it is listed is 200 proof alcohol! 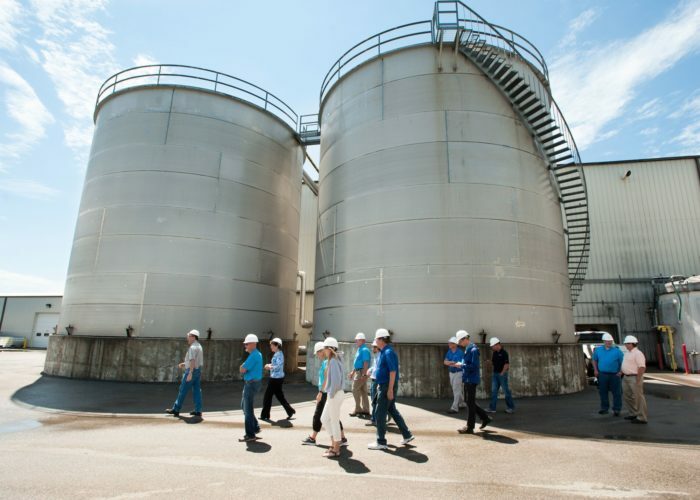 The remaining corn co-products are used to produce a high quality livestock feed called dried distillers grains (DDGs), as well as a non-edible grade of corn oil used to make biodiesel. 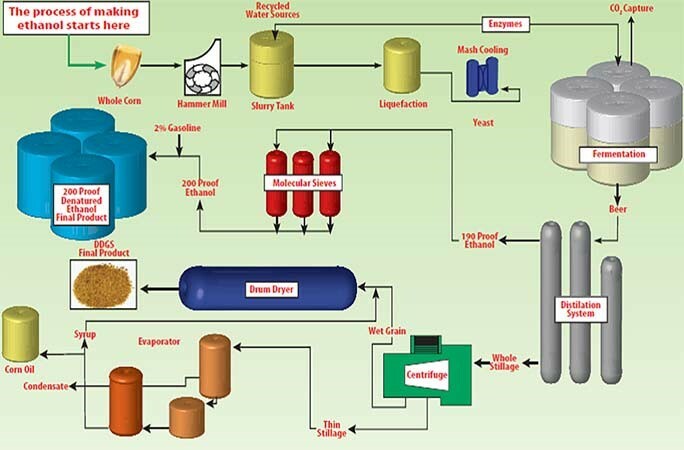 Below is a Process Diagram from Al-Corn ethanol plant’s website which provides a great visual overview of the ethanol production process. The long journey of corn from ground to ethanol fuel and livestock feed is amazing. Through a combination of chemistry and biology we are able to create a cleaner, sustainable, and economically viable alternative to petroleum gasoline.